This entry was posted in Photographs, Poems 2018 and tagged civility, climate, photography, poetry, politics, urban sprawl. Bookmark the permalink. Drought, dust and wildfires are on everyone’s mind. In my community, drought haunts us. On the high desert steppe, around our mountain valley, most of the livestock have been removed, the wild horse advocates are hauling water to horses, and the wildlife have moved or are living off the water tanks and reservoirs developed by ranchers. We are in “Severe Drought,” according to the United States Drought Monitor. To the north of us, it is “Abnormally Dry” and to the south, there’s “Extreme Drought”. This is a measurement of what we can see all around us. And we are better off than many. As I study the map, I see a bullseye over the Four Corners area of “Exceptional Drought”—a deep red color that looks ominous. It is. Another statistic from the National Oceanic and Atmospheric Administration cites that the eleven Western states are 83.5 per cent in various degrees of drought, compared to 35.8 per cent a year ago (mid-August). Of course, if it is your area, it is still 100 per cent. If you like studying these charts and statistics, you can look at their websites at http://www.drought.gov/drought/rcc/west and http://droughtmonitor.unl.edu/CurrentMap/StateDroughtMonitor.aspx?west. We started a year ago with an average fall, as I recall. As always, everyone studied the wooly caterpillars or other runes, and proclaimed that we were in for a bad winter. We and our neighbors either sent cattle and sheep to winter pastures elsewhere, or snugged them up with piles of hay and corn at hand. We waited. The mountain passes stayed open a month later than usual, and the snowmobilers were grumbling. Finally, some snows came and we settled in for winter. Except, in December and January we got warmish weather and rains, which melted the snowpack we did have and carried it down the streams. The ground was frozen, so none soaked in. The only beneficiaries were our neighbors to the south as some of the runoff made its way to Lake Powell and Lake Mead. Storage plays a critical role. As my Dad used to say, “It was the highest grade of the kids who flunked.” Now the headlines are reporting “Colorado River Projected To Hit Shortage In 2020”. “Earlier in 2018 Bureau of Reclamation Commissioner Brenda Burman warned water managers, farmers and city leaders throughout the southwest that the status quo was unacceptable and any delay in action on drought plans could cause the river’s biggest reservoirs to “crash.” (KUNC radio, Greeley, Colorado). Predictions are for more of the same, although weather is tricky to forecast. The truth is, whatever your politics or beliefs, the climate is changing. All the agriculturalists I know are actively changing the way they’ve done thing for years in response to these changes. From our individual perspectives, the cause doesn’t matter. The effect does. 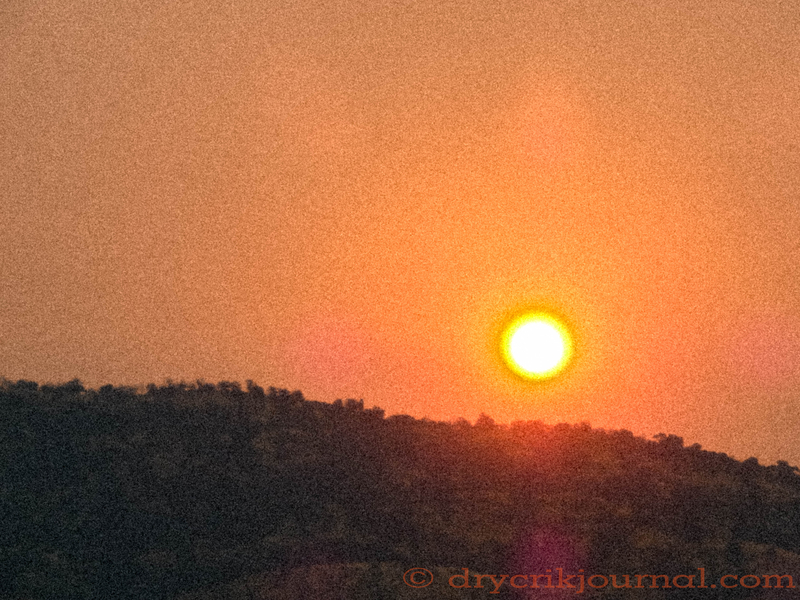 Which brings us to fire….no one in the West has been immune from this summer’s fires. Some have been completely devastated, losing their homes, pasturelands, and sometimes even livestock. Recall that fighting fire with fire was what landed Dwight and Stephen Hammond in prison, with all the consequences that came from that. In California, towns and farms have burned, affecting some folks we know. Given the few degrees of separation between most people, these fires probably affected friends and family of most of The Shepherd’s readers. The Wall Street Journal reported in August, “Poor land management marked by bureaucratic red tape ‘and excessive litigation during the past 30 years has led to the declining health of our national forests. The result is a marked increase in acreage ravaged by insects, disease and fire, fewer jobs and productivity in the forestry sector and a reduced amount of domestically produced lumber entering the market. Failure to properly maintain forests through prudent timber extraction has resulted in an overstocking of trees that has provided fuel for more and larger deadly fires on U.S. Forest Service (USFS) lands. I couldn’t have said it better myself. When I posted this on my Facebook page, it drew comments placing all the blame on climate change. In the Routt and Medicine Bow National Forest, contiguous to our ranch, thousands of square miles of pine trees rise dead and skeletal along the horizon. The only healthy young trees are growing in the clearcuts which were logged before the pine beetle infestation (which exploded after warmer winters failed to keep their numbers in check). Our local Conservation District had contracted with the Forest Service to clear dead and dying pines along the highway. The areas that were cleared show healthy young trees, but the Forest Service did not allow them to do as much work as planned. The sawmill in Encampment, Wyoming closed. The one in nearby Saratoga has opened and closed and opened several times due to uncertainty in the contracts. Throughout this long slow death of trees, the wing-nut environmental groups have sued and sued and sued to eliminate logging, grazing and forest management. Forest Service personnel are now taking a new look at management. Indeed, they must because the fuel load is so great that conventional fire fighting techniques do not work. The fires are hotter, and more dangerous to the crews fighting them. In the meantime, our Valley, and virtually all of the West has spent months under a pall of smoke and dust. We are managing livestock in an attempt to maintain their health, and the health of the natural resources which we steward. We are curtailing irrigation to our hayfields, which produce our winter feed, in order to keep our fish alive. The water masters in both states are studying old archives in order to sort out water rights. It is their charge to legally allocate this precious resource as it comes under increasing demand from all users, especially the hot and thirsty cities. Thank you for this dynamic poem. Those of us who live on the land should be screaming the loudest, we’ve been living with changes already… I appreciate this words.